Did you know you don’t have to live with a drippy, rusty, or poor functioning shower head? Learn how to Easily Install a New Shower Head for a simple bathroom update. Oh $*+! Did you drop your favorite earring down the drain? Put down the phone, you can easily learn How to Retrieve Items Dropped Down the Drain by following these few steps. And hey, even if it isn’t your favorite earring, you’ll want to remove the item to prevent a future clog. Replacing Water Lines with Braided Metal Hoses is as easy as attaching your garden hose. But, it can save you thousands of dollars in damages from a burst water line. If you don’t have the braided metal type of hoses, you’ll want to learn how to replace them. Drip, drip, drip! Is that leaky faucet keeping you up at night? I have a 10 minute fix that will bring you sweet dreams and a lower water bill. Follow this simple tutorial for Fixing a Leaky Faucet. Sometimes the simplest and least expensive solution for a leaking faucet doesn’t fix the issue (especially if the faucet has been leaking for a long time.) Don’t fret, you can still stop the dripping without replacing the entire faucet or resorting to calling a plumber. Learn how to replace the valve stems in just a few minutes. Years ago, my mom’s kitchen sink sprayer started spraying us! We tried to clean the head, but ultimately gave her faucet the boot. Learn how you too can install a new sink faucet in no time. Occasionally a sink drain assembly will fail on you. You don’t have to wash your money down the drain by hiring a plumber. Instead, see how easy it is to replace a sink drain. 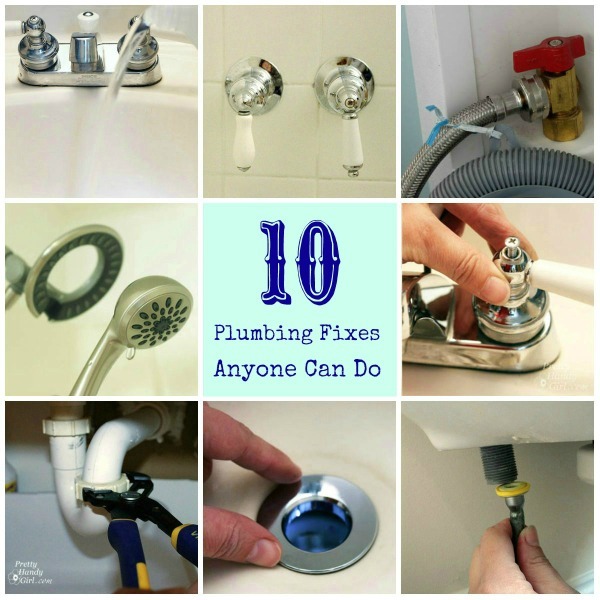 I hope you have the confidence to take on your own plumbing fix after reading these 11 Plumbing Fixes You Can Complete on your own. Remember, I believe in you, go ahead and believe in yourself. Thanks for this post. I’ve done some of these but I’ve had a leaky bathroom faucet for a year. I just shut the hot water off under the sink and would occasionally turn it on if needed. I had looked at it once but could not figure out how to get the faucet off. But after reading your post I looked again. Mine did not have a button on top but when I turned the faucet all the way around I saw a small hole and a lightbulb went off in my head. I thought an allen wrench might fit in that hole and it did!! I will finish taking it apart to get the ring and washer and go get new ones tomorrow. Just the motivation I needed. THANKS. thanks for this post! Plumbing is so hard and I have thrown away a lot of money on getting things fixed. I have a broken outdoor faucet handle that won’t come off, the screw is rusted or frozen on or something. (I live near the ocean, so everything gets either rusty, moldy, or frozen eventually…) Any tips on how to get that bugger off? Thanks a ton! Thanks a lot, Brittany ! You are so awesome. I love your site. It gives me the confidence to do things and try things. So grateful you share your talent. Take care. Do you have A HOW TO on cleaning a kitchen sink trap by any chance? Thanks for all the great information!